Fit Bayesian generalized (non-)linear multivariate multilevel models using 'Stan' for full Bayesian inference. A wide range of distributions and link functions are supported, allowing users to fit -- among others -- linear, robust linear, count data, survival, response times, ordinal, zero-inflated, hurdle, and even self-defined mixture models all in a multilevel context. Further modeling options include non-linear and smooth terms, auto-correlation structures, censored data, meta-analytic standard errors, and quite a few more. In addition, all parameters of the response distribution can be predicted in order to perform distributional regression. Prior specifications are flexible and explicitly encourage users to apply prior distributions that actually reflect their beliefs. Model fit can easily be assessed and compared with posterior predictive checks and leave-one-out cross-validation. References: Bürkner (2017) ; Carpenter et al. (2017) . 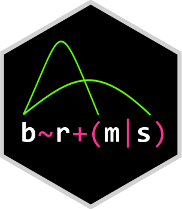 The brms package provides an interface to fit Bayesian generalized (non-)linear multivariate multilevel models using Stan, which is a C++ package for performing full Bayesian inference (see http://mc-stan.org/). The formula syntax is very similar to that of the package lme4 to provide a familiar and simple interface for performing regression analyses. A wide range of distributions and link functions are supported, allowing users to fit -- among others -- linear, robust linear, count data, survival, response times, ordinal, zero-inflated, hurdle, and even self-defined mixture models all in a multilevel context. Further modeling options include non-linear and smooth terms, auto-correlation structures, censored data, missing value imputation, and quite a few more. In addition, all parameters of the response distribution can be predicted in order to perform distributional regression. Multivariate models (i.e. models with multiple response variables) can be fitted, as well. Prior specifications are flexible and explicitly encourage users to apply prior distributions that actually reflect their beliefs. Model fit can easily be assessed and compared with posterior predictive checks, leave-one-out cross-validation, and Bayes factors. As a simple example, we use poisson regression to model the seizure counts in epileptic patients to investigate whether the treatment (represented by variable Trt) can reduce the seizure counts and whether the effect of the treatment varies with the baseline number of seizures a person had before treatment (variable log_Base4_c). As we have multiple observations per person, a group-level intercept is incorporated to account for the resulting dependency in the data. #> scale reduction factor on split chains (at convergence, Rhat = 1). On the top of the output, some general information on the model is given, such as family, formula, number of iterations and chains. Next, group-level effects are displayed seperately for each grouping factor in terms of standard deviations and (in case of more than one group-level effect per grouping factor; not displayed here) correlations between group-level effects. On the bottom of the output, population-level effects (i.e. regression coefficients) are displayed. If incorporated, autocorrelation effects and family specific parameters (e.g. the residual standard deviation 'sigma' in normal models) are also given. In general, every parameter is summarized using the mean ('Estimate') and the standard deviation ('Est.Error') of the posterior distribution as well as two-sided 95% credible intervals ('l-95% CI' and 'u-95% CI') based on quantiles. We see that the coefficient of Trt is negative with a completely negative 95%-CI indicating that, on average, the treatment reduces seizure counts by some amount. Further, we find little evidence that the treatment effect varies with the baseline number of seizures. The last two values ('Eff.Sample' and 'Rhat') provide information on how well the algorithm could estimate the posterior distribution of this parameter. If 'Rhat' is considerably greater than 1, the algorithm has not yet converged and it is necessary to run more iterations and / or set stronger priors. Both methods return the same etimate (up to random error), while the latter has smaller variance, because the uncertainty in the regression line is smaller than the uncertainty in each response. If we want to predict values of the original data, we can just leave the newdata argument empty. Since smaller LOOIC values indicate better fit, we see that the model accounting for overdispersion fits substantially better. The post-processing methods we have shown so far are just the tip of the iceberg. For a full list of methods to apply on fitted model objects, type methods(class = "brmsfit"). Detailed instructions and case studies are given in the package's extensive vignettes. See vignette(package = "brms") for an overview. For documentation on formula syntax, families, and prior distributions see help("brm"). How do I cite brms? Bürkner P. C. (in press). Advanced Bayesian Multilevel Modeling with the R Package brms. The R Journal. Make plotting of marginal_effects more robust to the usage of non-standard variable names. Deactivate certain data validity checks when using custom families. Improve efficiency of adjacent category models. No longer print informational messages from the Stan parser. Fix an issue that could result in a substantial efficiency drop of various post-processing methods for larger models. Allow setting priors on the overall intercept in sparse models. Fix a problem when trying to sample from priors of parameter transformations. Correctly update warmup samples when using update.brmsfit. Fit factor smooth interactions thanks to Simon Wood. Compute density ratios based on MCMC samples via density_ratio. Ignore offsets in various post-processing methods via argument offset. Update addition terms in formulas via update_adterms. Improve internal modularization of smooth terms. Reduce size of internal example models. Correctly plot splines with factorial covariates via marginal_smooths. Allow logical operators in non-linear formulas. Compute estimated values of non-linear parameters via argument nlpar in method fitted. Disable automatic cell-mean coding in model formulas without an intercept via argument cmc of brmsformula and related functions thanks to Marie Beisemann. Specify post-processing functions of custom families directly in custom_family. Allow to overwrite already stored fit indices when using add_ic. Deprecate usage of binomial families without specifying trials. No longer sample from priors of population-level intercepts when using the default intercept parameterization. Correctly sample from LKJ correlation priors thanks to Donald Williams. Ensure correct handling of argument file in brm_multiple. Compute LOO-adjusted R-squared using method loo_R2. Compute non-linear predictors outside of a loop over observations by means of argument loop in brmsformula. Allow horseshoe and lasso priors to be set on special population-level effects. Allow vectors of length greater one to be passed to set_prior. Display posterior probabilities in the output of hypothesis. Deprecate argument stan_funs in brm in favor of using the stanvars argument for the specification of custom Stan functions. Deprecate arguments flist and ... in nlf. Deprecate argument dpar in lf and nlf. Improve scaling of default priors in lognormal models (#460). Fix multiple problems in the post-processing of categorical models. Fix validation of nested grouping factors in post-processing methods when passing new data thanks to Liam Kendall. Export zero-inflated and hurdle distribution functions. Extend cor_car to support intrinsic CAR models in pairwise difference formulation thanks to the case study of Mitzi Morris. Compute loo and related methods for non-factorizable normal models. No longer show information criteria in the summary output. Introduce function make_conditions to ease preparation of conditions for marginal_effects. Change the parameterization of weibull and exgaussian models to be consistent with other model classes. Post-processing of related models fitted with earlier version of brms is no longer possible. Treat integer responses in ordinal models as directly indicating categories even if the lowest integer is not one. Always plot by variables as facets in marginal_smooths. Deprecate the cor_bsts correlation structure. Allow the : operator to combine groups in multi-membership terms thanks to Gang Chen. Combine multiple brmsfit objects via function combine_models. Vectorize user-defined Stan functions exported via export_functions using argument vectorize. Allow predicting new data in models with ARMA autocorrelation structures. Correctly recover noise-free coefficients through me terms thanks to Ruben Arslan. As a side effect, it is no longer possible to define priors on noise-free Xme variables directly, but only on their hyper-parameters meanme and sdme. Export the helper functions posterior_summary and posterior_table both being used to summarize posterior samples and predictions. Fix pointwise computation of LOO and WAIC in multivariate models with estimated residual correlation structure. Fix problems in various S3 methods sometimes requiring unused variables to be specified in newdata. Fix naming of Stan models thanks to Hao Ran Lai. This is the second major release of brms. The main new feature are generalized multivariate models, which now support everything already possible in univariate models, but with multiple response variables. Further, the internal structure of the package has been improved considerably to be easier to maintain and extend in the future. In addition, most deprecated functionality and arguments have been removed to provide a clean new start for the package. Models fitted with brms 1.0 or higher should remain fully compatible with brms 2.0. Specify different formulas for different categories in categorical models. Add weakly informative default priors for the parameter class Intercept to improve convergence of more complex distributional models. Refactor many parts of the package to make it more consistent and easier to extend. No longer support certain prior specifications, which were previously labeled as deprecated. Remove the depreacted addition term disp from the package. Remove old versions of methods fixef, ranef, coef, and VarCorr. No longer support models fitted with brms < 1.0, which used the multivariate 'trait' syntax orginally deprecated in brms 1.0. Make posterior sample extraction in the summary method cleaner and less error prone. No longer fix the seed for random number generation in brm to avoid unexpected behavior in simulation studies. Allow setting priors on noise-free variables specified via function me. Add arguments Ksub, exact_loo and group to method kfold for defining omitted subsets according to a grouping variable or factor. Allow addition argument se in skew_normal models. Ensure correct behavior of horseshoe and lasso priors in multivariate models thanks to Donald Williams. Fix problems in marginal_smooths occuring for multi-membership models thanks to Hans Tierens. Introduce methods posterior_linpred and posterior_interval for consistency with other model fitting packages based on Stan. Introduce function theme_black providing a black ggplot2 theme. Specify special group-level effects within the same terms as ordinary group-level effects. Add argument newdata to the kfold method. Add several arguments to the plot method of marginal_effects to improve control over the appearences of the plots. Make names of local-level terms used in the cor_bsts structure more informative. Store the autocor argument within brmsformula objects. Store posterior and prior samples in separate slots in the output of method hypothesis. Refactor parts of extract_draws and linear_predictor to be more consistent with the rest of the package. Do not silence the Stan parser when calling brm to get informative error messages about invalid priors. Fix problems with spaces in priors passed to set_prior. Handle non data.frame objects correctly in hypothesis.default. Fix a problem relating to the colour of points displayed in marginal_effects. Perform model comparisons based on marginal likelihoods using the methods bridge_sampler, bayes_factor, and post_prob all powered by the bridgesampling package. Compute a Bayesian version of R-squared with the bayes_R2 method. Specify non-linear models for all distributional parameters. Combine multiple model formulas using the + operator and the helper functions lf, nlf, and set_nl. Combine multiple priors using the + operator. Split the nlpar argument of set_prior into the three arguments resp, dpar, and nlpar to allow for more flexible prior specifications. Refactor parts of the package to prepare for the implementation of more flexible multivariate models in future updates. Keep all constants in the log-posterior in order for bridge_sampler to be working correctly. Reduce the amount of renaming done within the stanfit object. Rename argument auxpar of fitted.brmsfit to dpar. Use the launch_shinystan generic provided by the shinystan package. Set bayesplot::theme_default() as the default ggplot2 theme when attaching brms. Include citations of the brms overview paper as published in the Journal of Statistical Software. Fix problems when calling fitted with hurdle_lognormal models thanks to Meghna Krishnadas. Fix problems when predicting sigma in asym_laplace models thanks to Anna Josefine Sorensen. Fit conditional autoregressive (CAR) models via function cor_car thanks to the case study of Max Joseph. Fit spatial autoregressive (SAR) models via function cor_sar. Currently works for families gaussian and student. Implement skew normal models via family skew_normal. Thanks to Stephen Martin for suggestions on the parameterization. Add method reloo to perform exact cross-validation for problematic observations and kfold to perform k-fold cross-validation thanks to the Stan Team. Regularize non-zero coefficients in the horseshoe prior thanks to Juho Piironen and Aki Vehtari. Add argument new_objects to various post-processing methods to allow for passing of data objects, which cannot be passed via newdata. Improve parallel execution flexibility via the future package. Improve efficiency and stability of ARMA models. Throw an error when the intercept is removed in an ordinal model instead of silently adding it back again. Deprecate argument threshold in brm and instead recommend passing threshold directly to the ordinal family functions. Throw an error instead of a message when invalid priors are passed. Change the default value of the autocor slot in brmsfit objects to an empty cor_brms object. Shorten Stan code by combining declarations and definitions where possible. Fix problems in pp_check when the variable specified in argument x has attributes thanks to Paul Galpern. Fix problems when computing fitted values for truncated discrete models based on new data thanks to Nathan Doogan. Fix unexpected errors when passing models, which did not properly initiliaze, to various post-processing methods. Do not accidently drop the second dimension of matrices in summary.brmsfit for models with only a single observation. Fit latent Gaussian processes of one or more covariates via function gp specified in the model formula (#221). Rework methods fixef, ranef, coef, and VarCorr to be more flexible and consistent with other post-processing methods (#200). Generalize method hypothesis to be applicable on all objects coercible to a data.frame (#198). Visualize predictions via spaghetti plots using argument spaghetti in marginal_effects and marginal_smooths. Introduce method add_ic to store and reuse information criteria in fitted model objects (#220). Allow for negative weights in multi-membership grouping structures. Introduce an as.array method for brmsfit objects. Show output of \R code in HTML vignettes thanks to Ben Goodrich (#158). Resolve citations in PDF vignettes thanks to Thomas Kluth (#223). Improve sampling efficiency for exgaussian models thanks to Alex Forrence (#222). Also transform data points when using argument transform in marginal_effects thanks to Markus Gesmann. Fix an unexpected error in marginal_effects occuring for some models with autocorrelation terms thanks to Markus Gesmann. the cor_bsts structure thanks to Andrew Ellis. Implement zero-one-inflated beta models via family zero_one_inflated_beta. Allow for more link functions in zero-inflated and hurdle models. Ensure full compatibility with bayesplot version 1.2.0. Fix problems when setting priors on coefficients of auxiliary parameters when also setting priors on the corresponding coefficients of the mean parameter. Thanks to Matti Vuorre for reporting this bug. Allow ordered factors to be used as grouping variables thanks to the GitHub user itissid. Fit finite mixture models using family function mixture. Introduce method pp_mixture to compute posterior probabilities of mixture component memberships thanks to a discussion with Stephen Martin. Implement different ways to sample new levels of grouping factors in predict and related methods through argument sample_new_levels. Thanks to Tom Wallis and Jonah Gabry for a detailed discussion about this feature. Add methods loo_predict, loo_linpred, and loo_predictive_interval for computing LOO predictions thanks to Aki Vehtari and Jonah Gabry. Allow using offset in formulas of non-linear and auxiliary parameters. Allow sparse matrix multiplication in non-linear and distributional models. Allow using the identity link for all auxiliary parameters. Introduce argument negative_rt in predict and posterior_predict to distinquish responses on the upper and lower boundary in wiener diffusion models thanks to Guido Biele. Introduce method control_params to conveniently extract control parameters of the NUTS sampler. Introduce argument int_conditions in marginal_effects for enhanced plotting of two-way interactions thanks to a discussion with Thomas Kluth. Improve flexibility of the conditions argument of marginal_effects. Extend method stanplot to correctly handle some new mcmc_ plots of the bayesplot package. Improve the update method to only recompile models when the Stan code changes. Warn about divergent transitions when calling summary or print on brmsfit objects. Warn about unused variables in argument conditions when calling marginal_effects. Export and document several distribution functions that were previously kept internal. Fix problems with the inclusion of offsets occuring for more complicated formulas thanks to Christian Stock. Fix a bug that led to invalid Stan code when sampling from priors in intercept only models thanks to Tom Wallis. Correctly check for category specific group-level effects in non-ordinal models thanks to Wayne Folta. Fix problems in pp_check when specifying argument newdata together with arguments x or group. Rename the last column in the output of hypothesis to "star" in order to avoid problems with zero length column names thanks to the GitHub user puterleat. Add a missing new line statement at the end of the summary output thanks to Thomas Kluth. Allow horseshoe and lasso priors to be applied on population-level effects of non-linear and auxiliary parameters. Force recompiling Stan models in update.brmsfit via argument recompile. Avoid indexing of matrices in non-linear models to slightly improve sampling speed. Fix a severe problem (introduced in version 1.5.0), when predicting Beta models thanks to Vivian Lam. Fix problems when summarizing some models fitted with older version of brms thanks to Vivian Lam. Fix checks of argument group in method pp_check thanks to Thomas K.
Get arguments subset and nsamples working correctly in marginal_smooths. Implement the generalized extreme value distribution via family gen_extreme_value. Improve flexibility of the horseshoe prior thanks to Juho Piironen. Introduce auxiliary parameter mu as an alternative to specifying effects within the formula argument in function brmsformula. Return fitted values of auxiliary parameters via argument auxpar of method fitted. Add vignette "brms_multilevel", in which the advanced formula syntax of brms is explained in detail using several examples. Refactor various parts of the package to ease implementation of mixture and multivariate models in future updates. This should not have any user visible effects. Save the version number of rstan in element version of brmsfit objects. Fix a rare error when predicting von_mises models thanks to John Kirwan. Fit quantile regression models via family asym_laplace (asymmetric Laplace distribution). Specify non-linear models in a (hopefully) more intuitive way using brmsformula. Fix auxiliary parameters to certain values through brmsformula. Allow family to be specified in brmsformula. Introduce family frechet for modelling strictly positive responses. Allow truncation and censoring at the same time. Introduce function prior_ allowing to specify priors using one-sided formulas or quote. Pass priors to Stan directly without performing any checks by setting check = FALSE in set_prior. Introduce method nsamples to extract the number of posterior samples. Export the main formula parsing function parse_bf. Add more options to customize two-dimensional surface plots created by marginal_effects or marginal_smooths. Change structure of brmsformula objects to be more reliable and easier to extend. Make sure that parameter nu never falls below 1 to reduce convergence problems when using family student. Make handling of addition terms more transparent by exporting and documenting related functions. Refactor helper functions of the fitted method to be easier to extend in the future. Remove many units tests of internal functions and add tests of user-facing functions instead. Import some generics from nlme instead of lme4 to remove dependency on the latter one. Do not apply structure to NULL anymore to get rid of warnings in \R-devel. Fix problems when fitting smoothing terms with factors as by variables thanks to Milani Chaloupka. Fix a bug that could cause some monotonic effects to be ignored in the Stan code thanks to the GitHub user bschneider. Make sure that the data of models with only a single observation are compatible with the generated Stan code. Handle argument algorithm correctly in update.brmsfit. Fix a bug sometimes causing an error in marginal_effects when using family wiener thanks to Andrew Ellis. Fix problems in fitted when applied to zero_inflated_beta models thanks to Milani Chaloupka. Fix minor problems related to the prediction of autocorrelated models. Fix a few minor bugs related to the backwards compatibility of multivariate and related models fitted with brms < 1.0.0. Introduce the auxiliary parameter disc ('discrimination') to be used in ordinal models. By default it is not estimated but fixed to one. Create marginal_effects plots of two-way interactions of variables that were not explicitely modeled as interacting. Move rstan to 'Imports' and Rcpp to 'Depends' in order to avoid loading rstan into the global environment automatically. Fix a bug leading to unexpected errors in some S3 methods when applied to ordinal models. Fit error-in-variables models using function me in the model formulae. Fit multi-membership models using function mm in grouping terms. Add families exgaussian (exponentially modified Gaussian distribution) and wiener (Wiener diffusion model distribution) specifically suited to handle for response times. Add the lasso prior as an alternative to the horseshoe prior for sparse models. Add the methods log_posterior, nuts_params, rhat, and neff_ratio for brmsfit objects to conveniently access quantities used to diagnose sampling behavior. Combine chains in method as.mcmc using argument combine_chains. Estimate the auxiliary parameter sigma in models with known standard errors of the response by setting argument sigma to TRUE in addition function se. Allow visualizing two-dimensional smooths with the marginal_smooths method. Require argument data to be explicitely specified in all user facing functions. Refactor the stanplot method to use bayesplot on the backend. Use the bayesplot theme as the default in all plotting functions. Add the abbreviations mo and cs to specify monotonic and category specific effects respectively. Rename generated variables in the data.frames returned by marginal_effects to avoid potential naming conflicts. Deprecate argument cluster and use the native cores argument of rstan instead. Remove argument cluster_type as it is no longer required to apply forking. Remove the deprecated partial argument. Add the new family hurdle_lognormal specifically suited for zero-inflated continuous responses. Introduce the pp_check method to perform various posterior predictive checks using the bayesplot package. Introduce the marginal_smooths method to better visualize smooth terms. Allow varying the scale of global shrinkage parameter of the horseshoe prior. Add functions prior and prior_string as aliases of set_prior, the former allowing to pass arguments without quotes "" using non-standard evaluation. Introduce four new vignettes explaining how to fit non-linear models, distributional models, phylogenetic models, and monotonic effects respectively. Extend the coef method to better handle category specific group-level effects. Introduce the prior_summary method for brmsfit objects to obtain a summary of prior distributions applied. Sample from the prior of the original population-level intercept when sample_prior = TRUE even in models with an internal temporary intercept used to improve sampling efficiency. Introduce methods posterior_predict, predictive_error and log_lik as (partial) aliases of predict, residuals, and logLik respectively. Improve computation of Bayes factors in the hypothesis method to be less influenced by MCMC error. Improve documentation of default priors. Refactor internal structure of some formula and prior evaluating functions. This should not have any user visible effects. Use the bayesplot package as the new backend of plot.brmsfit. Better mimic mgcv when parsing smooth terms to make sure all arguments are correctly handled. Avoid an error occuring during the prediction of new data when grouping factors with only a single factor level were supplied thanks to Tom Wallis. Fix marginal_effects to consistently produce plots for all covariates in non-linear models thanks to David Auty. Improve the update method to better recognize situations where recompliation of the Stan code is necessary thanks to Raphael P.H. Allow to correctly update the sample_prior argument to value "only". Fix an unexpected error occuring in many S3 methods when the thinning rate is not a divisor of the total number of posterior samples thanks to Paul Zerr. Estimate category specific group-level effects. Allow t2 smooth terms based on multiple covariates. Estimate interval censored data via the addition argument cens in the model formula. Allow to compute residuals also based on predicted values instead of fitted values. Use the prefix bcs in parameter names of category specific effects and the prefix bm in parameter names of monotonic effects (instead of the prefix b) to simplify their identifaction. Ensure full compatibility with ggplot2 version 2.2. Fix a bug that could result in incorrect threshold estimates for cumulative and sratio models thanks to Peter Congdon. Fix a bug that sometimes kept distributional gamma models from being compiled thanks to Tim Beechey. Fix a bug causing an error in predict and related methods when two-level factors or logical variables were used as covariates in non-linear models thanks to Martin Schmettow. Fix a bug causing an error when passing lists to additional arguments of smoothing functions thanks to Wayne Folta. Fix a bug causing an error in the prior_samples method for models with multiple group-level terms that refer to the same grouping factor thanks to Marco Tullio Liuzza. Fix a bug sometimes causing an error when calling marginal_effects for weighted models. Center design matrices inside the Stan code instead of inside make_standata. Get rid of several warning messages occuring on CRAN. This is one of the largest updates of brms since its initial release. In addition to many new features, the multivariate 'trait' syntax has been removed from the package as it was confusing for users, required much special case coding, and was hard to maintain. See help(brmsformula) for details of the formula syntax applied in brms. Allow estimating correlations between group-level effects defined across multiple formulae (e.g., in non-linear models) by specifying IDs in each grouping term via an extended lme4 syntax. Implement distributional regression models allowing to fully predict auxiliary parameters of the response distribution. Among many other possibilities, this can be used to model heterogeneity of variances. Zero-inflated and hurdle models do not use multivariate syntax anymore but instead have special auxiliary parameters named zi and hu defining zero-inflation / hurdle probabilities. Implement the von_mises family to model circular responses. Introduce the brmsfamily function for convenient specification of family objects. Allow predictions of t2 smoothing terms for new data. Feature vectors as arguments for the addition argument trunc in order to model varying truncation points. Remove the cauchy family after several months of deprecation. Make sure that group-level parameter names are unambiguous by adding double underscores thanks to the idea of the GitHub user schmettow. The predict method now returns predicted probabilities instead of absolute frequencies of samples for ordinal and categorical models. Compute the linear predictor in the model block of the Stan program instead of in the transformed parameters block. This avoids saving samples of unnecessary parameters to disk. Thanks goes to Rick Arrano for pointing me to this issue. Colour points in marginal_effects plots if sensible. Set the default of the robust argument to TRUE in marginal_effects.brmsfit. Fix a bug that could occur when predicting factorial response variables for new data. Only affects categorical and ordinal models. Fix a bug that could lead to duplicated variable names in the Stan code when sampling from priors in non-linear models thanks to Tom Wallis. Fix problems when trying to pointwise evaluate non-linear formulae in logLik.brmsfit thanks to Tom Wallis. Ensure full compatibility of the ranef and coef methods with non-linear models. Fix problems that occasionally occured when handling dplyr datasets thanks to the GitHub user Atan1988. Add support for generalized additive mixed models (GAMMs). Smoothing terms can be specified using the s and t2 functions in the model formula. Introduce as.data.frame and as.matrix methods for brmsfit objects. The gaussian("log") family no longer implies a log-normal distribution, but a normal distribution with log-link to match the behavior of glm. The log-normal distribution can now be specified via family lognormal. Update syntax of Stan models to match the recommended syntax of Stan 2.10. The ngrps method should now always return the correct result for non-linear models. Fix problems in marginal_effects for models using the reserved variable intercept thanks to Frederik Aust. Fix a bug in the print method of brmshypothesis objects that could lead to duplicated and thus invalid row names. Residual standard deviation parameters of multivariate models are again correctly displayed in the output of the summary method. Fix problems when using variational Bayes algorithms with brms while having rstan >= 2.10.0 installed thanks to the GitHub user cwerner87. Allow the '/' symbol in group-level terms in the formula argument to indicate nested grouping structures. Allow to compute WAIC and LOO based on the pointwise log-likelihood using argument pointwise to substantially reduce memory requirements. Add horizontal lines to the errorbars in marginal_effects plots for factors. Fix a bug that could lead to a cryptic error message when changing some parts of the model formula using the update method. Fix a bug that could lead to an error when calling marginal_effects for predictors that were generated with the base::scale function thanks to Tom Wallis. Allow interactions of numeric and categorical predictors in marginal_effects to be passed to the effects argument in any order. Fix a bug that could lead to incorrect results of predict and related methods when called with newdata in models using the poly function thanks to Brock Ferguson. Make sure that user-specified factor contrasts are always applied in multivariate models. Add support for monotonic effects allowing to use ordinal predictors without assuming their categories to be equidistant. Apply multivariate formula syntax in categorical models to considerably increase modeling flexibility. Add the addition argument disp to define multiplicative factors on dispersion parameters. For linear models, disp applies to the residual standard deviation sigma so that it can be used to weight observations. Treat the fixed effects design matrix as sparse by using the sparse argument of brm. This can considerably reduce working memory requirements if the predictors contain many zeros. Add the cor_fixed correlation structure to allow for fixed user-defined covariance matrices of the response variable. Allow to pass self-defined Stan functions via argument stan_funs of brm. Add the expose_functions method allowing to expose self-defined Stan functions in R.
Extend the functionality of the update method to allow all model parts to be updated. Center the fixed effects design matrix also in multivariate models. This may lead to increased sampling speed in models with many predictors. Refactor Stan code and data generating functions to be more consistent and easier to extent. Improve checks of user-define prior specifications. Warn about models that have not converged. Make sure that regression curves computed by the marginal_effects method are always smooth. Allow to define category specific effects in ordinal models directly within the formula argument. Fix problems in the generated Stan code when using very long non-linear model formulas thanks to Emmanuel Charpentier. 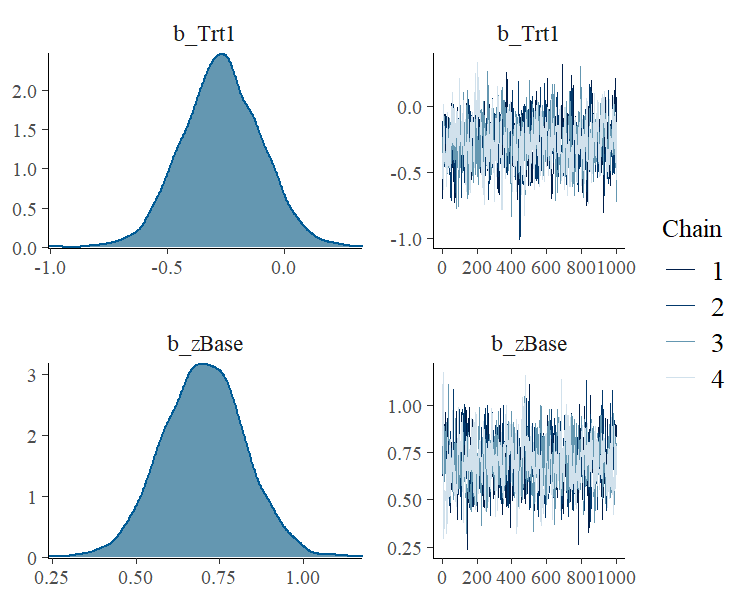 Fix a bug that prohibited to change priors on single standard deviation parameters in non-linear models thanks to Emmanuel Charpentier. Fix a bug that prohibited to use nested grouping factors in non-linear models thanks to Tom Wallis. Fix a bug in the linear predictor computation within R, occuring for ordinal models with multiple category specific effects. This could lead to incorrect outputs of predict, fitted, and logLik for these models. Make sure that the global "contrasts" option is not used when post-processing a model. Implement generalized non-linear models, which can be specified with the help of the nonlinear argument in brm. Compute and plot marginal effects using the marginal_effects method thanks to the help of Ruben Arslan. Implement zero-inflated beta models through family zero_inflated_beta thanks to the idea of Ali Roshan Ghias. Allow to restrict domain of fixed effects and autocorrelation parameters using new arguments lb and ub in function set_prior thanks to the idea of Joel Gombin. Add an as.mcmc method for compatibility with the coda package. Allow to call the WAIC, LOO, and logLik methods with new data. Make sure that brms is fully compatible with loo version 0.1.5. Optionally define the intercept as an ordinary fixed effect to avoid the reparametrization via centering of the fixed effects design matrix. Do not compute the WAIC in summary by default anymore to reduce computation time of the method for larger models. The cauchy family is now deprecated and will be removed soon as it often has convergence issues and not much practical application anyway. Change the default settings of the number of chains and warmup samples to the defaults of rstan (i.e., chains = 4 and warmup = iter / 2). Do not remove bad behaving chains anymore as they may point to general convergence problems that are dangerous to ignore. Improve flexibility of the theme argument in all plotting functions. Only show the legend once per page, when computing trace and density plots with the plot method. Move code of self-defined Stan functions to inst/chunks and incorporate them into the models using rstan::stanc_builder. Also, add unit tests for these functions. Fix problems when predicting with newdata for zero-inflated and hurdle models thanks to Ruben Arslan. Fix problems when predicting with newdata if it is a subset of the data stored in a brmsfit object thanks to Ruben Arslan. Fix data preparation for multivariate models if some responses are NA thanks to Raphael Royaute. Fix a bug in the predict method occurring for some multivariate models so that it now always returns the predictions of all response variables, not just the first one. Fix a bug in the log-likelihood computation of hurdle_poisson and hurdle_negbinomial models. This may lead to minor changes in the values obtained by WAIC and LOO for these models. Fix some backwards compatibility issues of models fitted with version <= 0.5.0 thanks to Ulf Koether. Use variational inference algorithms as alternative to the NUTS sampler by specifying argument algorithm in the brm function. Implement beta regression models through family Beta. Implement zero-inflated binomial models through family zero_inflated_binomial. Implement multiplicative effects for family bernoulli to fit (among others) 2PL IRT models. Generalize the formula argument for zero-inflated and hurdle models so that predictors can be included in only one of the two model parts thanks to the idea of Wade Blanchard. Combine fixed and random effects estimates using the new coef method. Call the residuals method with newdata thanks to the idea of Friederike Holz-Ebeling. Allow new levels of random effects grouping factors in the predict, fitted, and residuals methods using argument allow_new_levels. Selectively exclude random effects in the predict, fitted, and residuals methods using argument re_formula. Add a plot method for objects returned by method hypothesis to visualize prior and posterior distributions of the hypotheses being tested. Improve evaluation of the response part of the formula argument to reliably allow terms with more than one variable (e.g., y/x ~ 1). Improve sampling efficiency of models containing many fixed effects through centering the fixed effects design matrix thanks to Wayne Folta. Improve sampling efficiency of models containing uncorrelated random effects specified by means of (random || group) terms in formula thanks to Ali Roshan Ghias. Utilize user-defined functions in the Stan code of ordinal models to improve readability as well as sampling efficiency. Make sure that model comparisons using LOO or WAIC are only performed when models are based on the same responses. Use some generic functions of the lme4 package to avoid unnecessary function masking. This leads to a change in the argument order of method VarCorr. Change the ggplot theme in the plot method through argument theme. Remove the n. prefix in arguments n.iter, n.warmup, n.thin, n.chains, and n.cluster of the brm function. The old argument names remain usable as deprecated aliases. Amend names of random effects parameters to simplify matching with their respective grouping factor levels. Fix a bug in the hypothesis method that could cause valid model parameters to be falsely reported as invalid. Fix a bug in the prior_samples method that could cause prior samples of parameters of the same class to be artifically correlated. Fix Stan code of linear models with moving-average effects and non-identity link functions so that they no longer contain code related solely to autoregressive effects. Fix a bug in the evaluation of formula that could cause complicated random effects terms to be falsely treated as fixed effects. Fix several bugs when calling the fitted and predict methods with newdata thanks to Ali Roshan Ghias. Add support for zero-inflated and hurdle models thanks to the idea of Scott Baldwin. Implement inverse gaussian models through family inverse.gaussian. Allow to specify truncation boundaries of the response variable thanks to the idea of Maciej Beresewicz. Add support for autoregressive (AR) effects of residuals, which can be modeled using the cor_ar and cor_arma functions. Stationary autoregressive-moving-average (ARMA) effects of order one can now also be fitted using special covariance matrices. Binomial and ordinal families now support the cauchit link function. Allow family functions to be used in the family argument. Easy access to various rstan plotting functions using the stanplot method. Implement horseshoe priors to model sparsity in fixed effects coefficients thanks to the idea of Josh Chang. Automatically scale default standard deviation priors so that they remain only weakly informative independent on the response scale. Report model weights computed by the loo package when comparing multiple fitted models. Separate the fixed effects Intercept from other fixed effects in the Stan code to slightly improve sampling efficiency. Move autoregressive (AR) effects of the response from the cor_ar to the cor_arr function as the result of implementing AR effects of residuals. Improve checks on argument newdata used in the fitted and predict method. Method standata is now the only way to extract data that was passed to Stan from a brmsfit object. Slightly improve Stan code for models containing no random effects. Change the default prior of the degrees of freedom of the student family to gamma(2,0.1). Improve readability of the output of method VarCorr. Export the make_stancode function to give users direct access to Stan code generated by brms. Rename the brmdata function to make_standata. The former remains usable as a deprecated alias. Improve documenation to better explain differences in autoregressive effects across R packages. Fix a bug that could cause an unexpected error when the predict method was called with newdata. Avoid side effects of the rstan compilation routines that could occasionally cause R to crash. Make brms work correctly with loo version 0.1.3 thanks to Mauricio Garnier Villarreal and Jonah Gabry. Fix a bug that could cause WAIC and LOO estimates to be slightly incorrect for gaussian models with log link. Compute the Watanabe-Akaike information criterion (WAIC) and leave-one-out cross-validation (LOO) using the loo package. Provide an interface to shinystan with S3 method launch_shiny. New functions get_prior and set_prior to make prior specifications easier. Log-likelihood values and posterior predictive samples can now be calculated within R after the model has been fitted. Make predictions based on new data using S3 method predict. Allow for customized covariance structures of grouping factors with multiple random effects. New S3 methods fitted and residuals to compute fitted values and residuals, respectively. Arguments WAIC and predict are removed from the brm function, as they are no longer necessary. New argument cluster_type in function brm allowing to choose the cluster type created by the parallel package. Remove chains that fail to initialize while sampling in parallel leaving the other chains untouched. Redesign trace and density plots to be faster and more stable. S3 method VarCorr now always returns covariance matrices regardless of whether correlations were estimated. Fix a bug in S3 method hypothesis related to the calculation of Bayes-factors for point hypotheses. User-defined covariance matrices that are not strictly positive definite for numerical reasons should now be handled correctly. Fix problems when a factor is used as fixed effect and as random effects grouping variable at the same time thanks to Ulf Koether. Fix minor issues with internal parameter naming. Perform additional checking on user defined priors. Allow for sampling from all specified proper priors in the model. Compute Bayes-factors for point hypotheses in S3 method hypothesis. Fix a bug that could cause an error for models with multiple grouping factors thanks to Jonathan Williams. Fix a bug that could cause an error for weighted poisson and exponential models. Implement the Watanabe-Akaike Information Criterion (WAIC). Implement the ||-syntax for random effects allowing for the estimation of random effects standard deviations without the estimation of correlations. Allow to combine multiple grouping factors within one random effects argument using the interaction symbol :. Generalize S3 method hypothesis to be used with all parameter classes not just fixed effects. In addition, one-sided hypothesis testing is now possible. Introduce new family multigaussian allowing for multivariate normal regression. Introduce new family bernoulli for dichotomous response variables as a more efficient alternative to families binomial or categorical in this special case. Slightly change the internal structure of brms to reflect that rstan is finally on CRAN. Thoroughly check validity of the response variable before the data is passed to Stan. Prohibit variable names containing double underscores __ to avoid naming conflicts. Allow function calls with several arguments (e.g. poly(x,3)) in the formula argument of function brm. Always center random effects estimates returned by S3 method ranef around zero. Prevent the use of customized covariance matrices for grouping factors with multiple random effects for now. Remove any experimental JAGS code from the package. Fix a bug in S3 method hypothesis leading to an error when numbers with decimal places were used in the formulation of the hypotheses. Fix a bug in S3 method ranef that caused an error for grouping factors with only one random effect. Fix a bug that could cause the fixed intercept to be wrongly estimated in the presence of multiple random intercepts thanks to Jarrod Hadfield. Introduce new methods parnames and posterior_samples for class 'brmsfit' to extract parameter names and posterior samples for given parameters, respectively. Introduce new method hypothesis for class brmsfit allowing to test non-linear hypotheses concerning fixed effects. Introduce new argument addition in function brm to get a more flexible approach in specifying additional information on the response variable (e.g., standard errors for meta-analysis). Alternatively, this information can also be passed to the formula argument directly. Introduce weighted and censored regressions through argument addition of function brm. Introduce new argument cov.ranef in the brm function allowing for customized covariance structures of random effects thanks to the idea of Boby Mathew. Introduce new argument autocor in function brm allowing for autocorrelation of the response variable. Introduce new functions cor.ar, cor.ma, and cor.arma, to be used with argument autocor for modeling autoregressive, moving-average, and autoregressive-moving-average models. Amend parametrization of random effects to increase efficiency of the sampling algorithms. Improve vectorization of sampling statements. Fix a bug that could cause an error when fitting poisson models while predict = TRUE. Fix a bug that caused an error when sampling only one chain while silent = TRUE. New S3 class brmsfit to be returned by the brm function. New methods for class brmsfit: summary, print, plot, predict, fixef, ranef, VarCorr, nobs, ngrps, and formula. Introduce new argument silent in the brm function, allowing to suppress most of Stan's intermediate output. Introduce new families negbinomial (negative binomial) and geometric to allow for more flexibility in modeling count data. Amend warning and error messages to make them more informative. Correct examples in the documentation. Fix a bug that caused problems when formulas contained more complicated function calls. Fix a bug that caused an error when posterior predictives were sampled for family cumulative. Fix a bug that prohibited to use of improper flat priors for parameters that have proper priors by default.